BANGOR, Maine — After weeks of publicity and promotion, it’s showtime for the Hollywood Slots Waterfront Concert Series. Celtic Woman will kick off the five-show series at 7:30 tonight on the 200,000-pound stage erected over the weekend off Railroad and Front streets. City officials are bracing for heavy traffic congestion leading up to tonight’s first concert of the Hollywood Slots Waterfront Concert Series featuring Celtic Women. To accommodate the setup, Bangor police will close Railroad Street, from Summer Street to Front Street, beginning at noon. Front Street from the Sea Dog Restaurant to Railroad Street will close beginning at 2 p.m.
Security will staff the movable barricades at Railroad and Summer Streets, and Railroad Street is expected to be heavily congested from approximately 5 p.m. until the start of the show at 7 p.m.
A constant surge of activity has preceded tonight’s show, which features an all-female ensemble that combines Irish-Celtic culture, music and dance with glitzy showmanship. 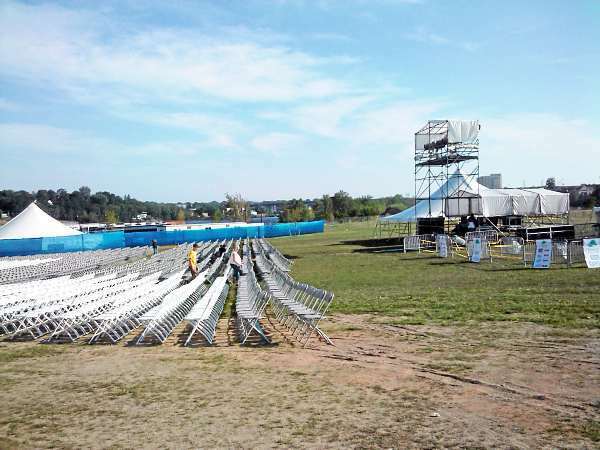 “We started in the rain at 8 a.m. Saturday with 50 workers and worked until 8 that night, and then 7 a.m. to 4 p.m. on Sunday,” concert promoter Alex Gray of Old Town said about assembling the 94-by-40-foot stage. Eight-foot fencing and screening have been installed around the venue and along the adjoining streets over the last two days, while food and drink vendors set up shop and seating was installed. Concertgoers will have several parking options. The Pickering Square Garage, which normally closes at 9 p.m., will expand its hours to accommodate the expected crowd. The concert grounds open for the show at 6 p.m. The show will have a 20-minute intermission at 8:30 and end around 9:50 p.m. A city-mandated curfew has been set for 10:30 p.m.
VIP parking spots will be available for $20 each near the venue entrances. The spots can be reserved in advance by calling 783-2009, but are available only first come, first served in cash the day of the show. Owners of boats who rent space at the city dock also will be provided space to park in this lot. Handicapped-accessible spots are available along Front Street near the Sea Dog Brewing Co., as well as regular city parking spots scattered around the area. For future shows, parking also will be made available at Bass Park, but is unavailable now because of the Bangor State Fair. All on-street parking spaces from the Sea Dog restaurant to Railroad Street, or about 20 spaces, will be temporarily posted for handicap parking. Tickets are available for the show at $35.50, $49.50 and $59.50. They can be purchased at Mark’s Music at Penobscot Square in Brewer, online at www.waterfrontconcerts.com or by phone at 783-8009. Fans also can purchase tickets at the box office at the junction of Railroad and Summer streets. Concertgoers can bring personal items into the venue such as cell phones, wallets, binoculars and anything that fits into pockets which isn’t considered contraband (drugs, alcohol), as well as blankets. 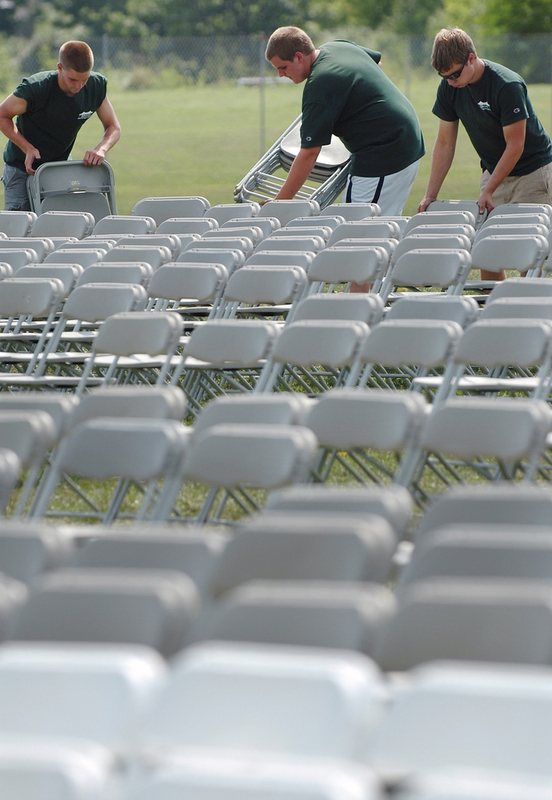 Recording devices are prohibited, and fans may not bring in umbrellas or lawn chairs, even if they’re sitting back in the lawn section. Fans can purchase adult beverages (draft beer, wine, Champagne), soda, iced tea and food from vendors inside the concert grounds, as well as from vendors inside the concert venue on Railroad Street. Fans will be allowed to get food in the concourse and be readmitted by showing their tickets. Portable toilet facilities are located at both ends of Railroad Street. Gray also is using a “go green” approach regarding trash and cleanup. “We’re going to be sorting everything, composting the trash we’re able to, and recycling anything we can,” he said. “Even the trash bags are compostable. Call 947-7382, extension 5896, for a recorded message detailing the road closures.